Ocean State Wellness Center is dedicated to providing compassionate, individualized pain treatment plans for many different types and causes of pain. Whether your pain is acute, chronic, or secondary to an illness, we will strive to create a plan of care that will fit your personal needs and lifestyle. At Ocean State Wellness Center, we recognize that each person is an individual, and therefore, every treatment plan must be personalized accordingly. We understand the complexity of pain, and will guide each patient through a treatment plan that is most appropriate for him or her. We also take pride in educating our patients and their families on the current treatment modalities available, as well as the treatment they will be receiving throughout their personalized program at our facility. 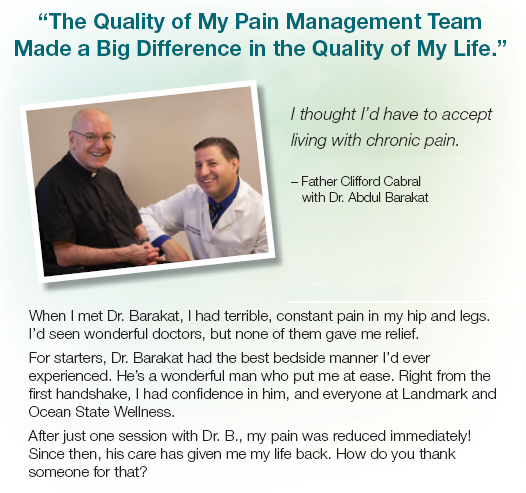 Treatment at our facility is provided under the care and direction of Pain Management Specialist, Abdul R. Barakat, MD. Please visit our Meet The Staff section for more information on our dedicated pain management providers. 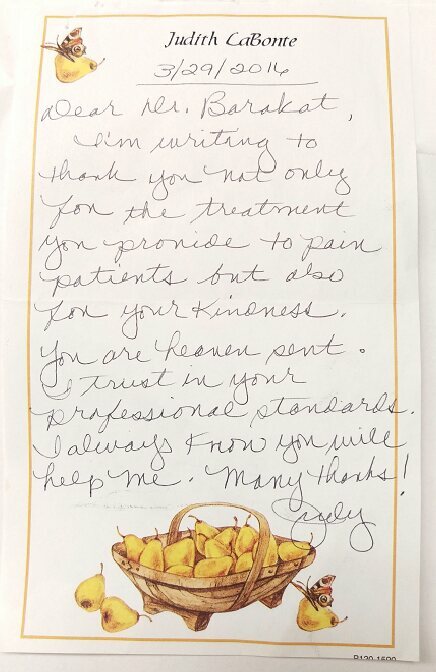 I'm writing to thank you not only for the treatment you provide to pain patients but also for your kindness. You are heaven sent. I trust in your professional standards. I always know you will help me. Many thanks!